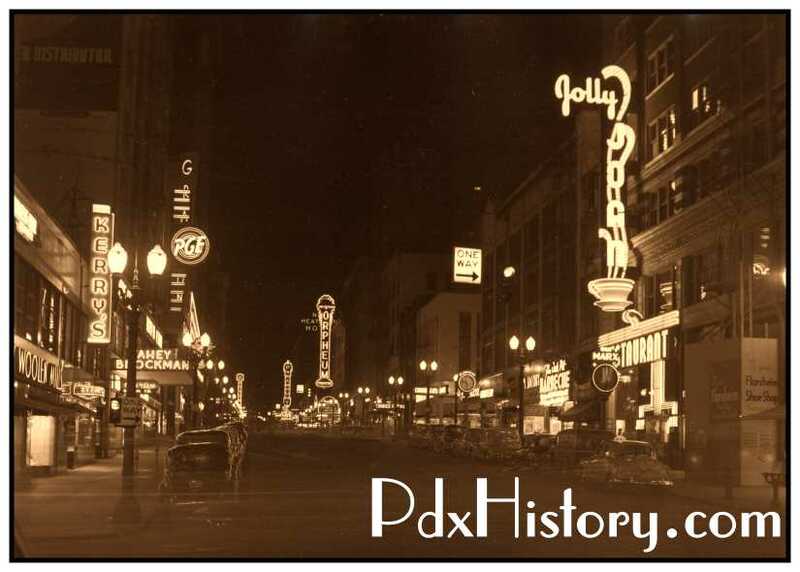 Once upon a time, Portland’s Broadway glowed like a jewel in the night. Nearly every major city has a Broadway and Portland is no exception. In fact, Portland’s Broadway goes north and south and crosses the Broadway Bridge where it also runs east and west. Broadway connects the Irvington and Lloyd Districts to Downtown. Portland’s “Great White Way” began to sparkle as a new Theatre District in 1913. In the 1890s and early 1900s, electricity was a new phenomenon. It was the key to many “modern conveniences”. It provided the energy to transport the masses and it changed life as we knew it. Several power plants were built to generate the power that was used to electrify the streetcar lines and to light Portland’s streets. It also ushered in a new era that brought us air conditioning, hot and cold running water, toasters, hair dryers and all the things we couldn’t live without today. Portland’s Theatre District on Broadway as it looked in 1928. Looking south on Broadway, you would see one of Portland’s most popular restaurants, Jolly Joan which featured a neon sign with the ever full steaming coffee cup. Another view of Broadway at night in the 1950s. Broadway is probably Portland’s most photographed street. This view is looking north from Main Street. Looking south on Broadway in the 1950s. Looking north on Broadway in the 1940s, Portland’s most prestigious address. The Magic of the Neon Night. Broadway was at the center of Portland’s Nightlife.